I have these spaces between my teeth from gum recession and gum shrinkage. I think the spaces are called “black triangles.” I absolutely hate them and don’t smile like I used to. I’m in the process of getting gum grafts but the grafts definitely will not fill in the black triangles. I’ve heard that black triangles are harder to correct than just regular spaces (diastema). 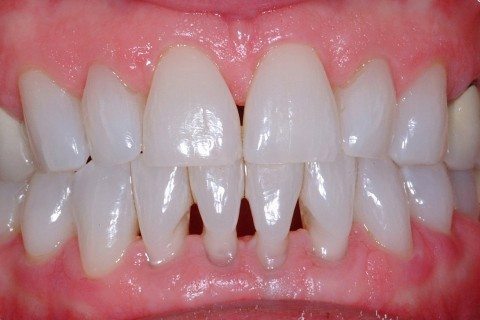 Will veneers or bonding take care of this problem? Any advice as to what I should do? I want to take care of this problem once all of my gum grafts have healed. Thank you for any insight! Yes, the black triangles are a difficult esthetic problem. The access and the geometry of this type of esthetic case make it very demanding. But if you go to an expert cosmetic dentist (and the ones we list in the Dallas-Fort Worth area are all terrific) they can fix that. It’s hard for me to say what would be best for you—it depends on the shape of your teeth, the condition of your gums, and other factors. Porcelain veneers are a possibility, direct bonding is another possibility. One small black triangle between the upper front teeth, and three large black triangles on the lower. My choice would be to correct this with direct dental bonding. But this area of the tooth down near the gumline is an awkward place for a dentist to work. Added to this is the complication that the gingival sulcus—the little groove between the gum and the tooth—is constantly oozing fluid which contaminates dental bonding. There are ways of controlling this, but it takes some expertise in this situation. Another way is to completely re-shape the teeth with porcelain veneers. This is easier, but is much more aggressive and more expensive. It would require the front surfaces of all your front teeth being shaved down a little. That can be done, but some people try to avoid that if possible. Don’t trust your smile to someone who merely claims to be a cosmetic dentist. Go with the real thing for this one. Here’s a photo of a black triangle corrected by an expert porcelain veneer dentist. Here’s another case of a black triangle case by cosmetic dentist Dr. Sue LeBlanc. Or—click here to read about a flexible silicone gingival mask prosthesis that can replace missing gum tissue and eliminate black triangles. Click here for referral to an expert cosmetic dentist who can treat black triangles.